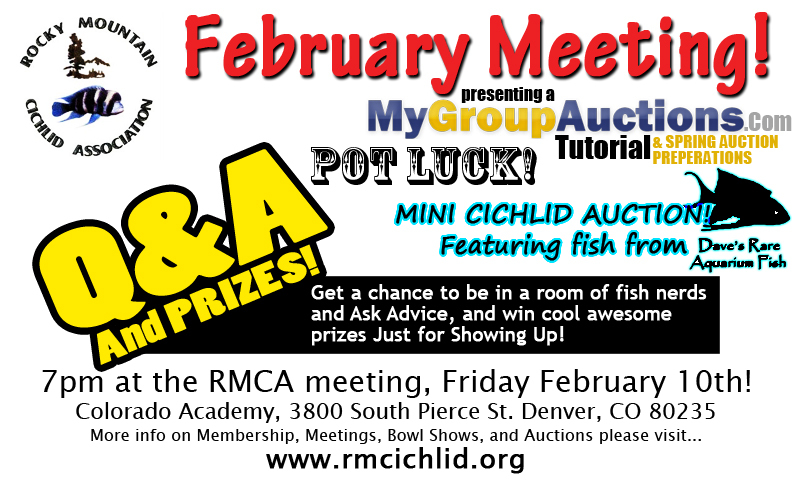 February Meeting! Friday Feb. 10th! We will be prepping you guys on the upcoming Spring Feb 18th Auction. With a basic tutorial on www.mygroupauctions.com for those who might need it. BIG Q&A Session! You have questions about keeping fish? Well we are dedicating a whole session, for you to ask a room of fish nerds for advice! Nothing but talking fish to each other as a group! There will also be some EPIC DOOR PRIZES! There will be a Pot Luck, so BRING FOOD! Meeting Officially Starts at 7pm. LAKE MALAWI – GROUP 2—MBUNA—Abactochromis, Cynotilapia, Gephyrochromis, Iodotropheus, Labeotropheus, Labidochromis, Melanochromis, Metriaclima, Petrotilapia, Pseudotropheus, Tropheops. LAKE TANGANYIKA – GROUP 2—JULIDOCHROMIS, LAMPROLOGINES, SHELL-DWELLERS—Altolamprologus, Chalinochromis, Julidochromis, Lamprologus, Lepidiolamprologus, Neolamprologus, Telmatochromis, Variabilichromis. OTHER AFRICAN/ASIAN CICHLIDS – GROUP 2—OTHER AFRICAN CICHLIDS—Alcolapia, Anomalochromis, Astatotilapia, (A. desfontainii), Benitochromis, Chetia, Chilochromis, Chromidotilapia, Congochromis, Cyclopharynx, Danakilia, Divandu, Enigmatochromis, Etia, Gaurochromis, Gobiocichla, Haplochromis (H. burtoni), Hemichromis, Heterochromis, Konia, Limbochromis, Macropleurodus, Myaka, Nanochromis, Oreochromis (O. mossambicus), Orthochromis, Parananochromis, Pelmatochromis, Pelvicachromis, Pharygochromis, Pseudocrenilabrus (P. nicholsi), Pterochromis, Pungu, Saratherodon, Sargochromis, Schwetzochromis, Steatocranus, Stomatepia, Teleogramma, Thoracochromis, Tilapia.Thysochromis. NEW WORLD CICHLIDS – GROUP 2—SOUTH AMERICAN CICHLIDS—Acarichthys, Acaronia, Aequidens, Amphilophus (A. festae), Andinoacara, Astronotus, Australoheros, Biotodoma, Bujurquina, Chaetobranchopsis, Chaetobranchus, Caquetaia, Cichla, Cichlasoma (C. dimerus), Crenicara, Crenicichla, Dicrossus, Geophagus, Guianacara, Gymnogeophagus, Heroina, Heros, Hoplarchus, Hypselecara, Krobia, Mazarunia, Mesonauta, Pterophyllum, Retroculus, Satanoperca, Symphysodon, Teleocichla, Uaru. (To view upcoming Bowl Show Categories visit the link below.